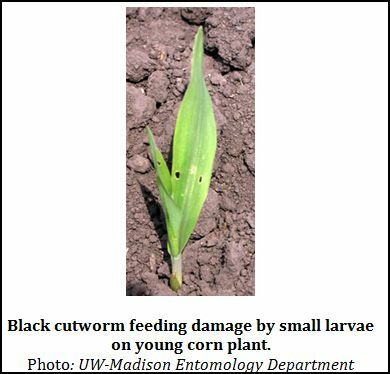 Corn planting and weed control delayed by wet field conditions coupled with a major black cutworm migration make black cutworm damage a likely event later this month. 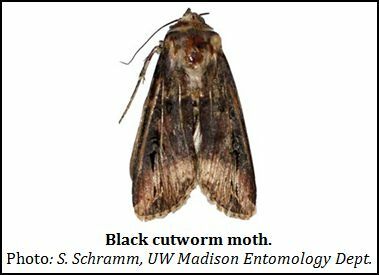 The WIDATCP Wisconsin Pest Bulletin noted a significant influx of black cutworm moths from the southern U.S. moved north by storm fronts during the first three weeks of April. Thus far, over 457 moths have been captured in 30 Wisconsin pheromone traps. Based on Wisconsin trap captures and a degree-day biofix date of April 11 this year, a cutting period starting May 30 is anticipated. Concerns over damage are greatest during the first ten days to two weeks after corn emergence. Scout fields for early feeding damage and presence of larvae. Continue to scout through V5 stage corn. Focus attention on corn fields which are most attractive for black cutworm oviposition. 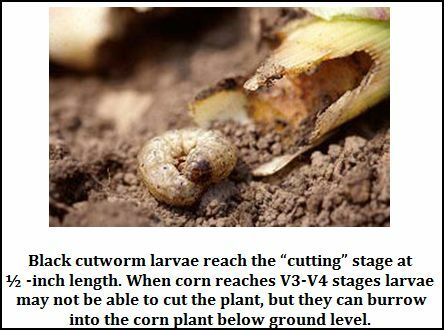 Black cutworm treatment is suggested if 5 percent of corn plants have cutting damage and cutworm larvae are 6th instar or smaller. With higher corn prices, a more conservative threshold is 2 to 3 percent cut or wilted plants if larvae are smaller than 3/4 inch. If larvae are longer than 3/4 inch, the threshold remains at 5 percent cut plants (Iowa State University). More information on black cutworm as well as foliar insecticide treatment options are available on Pg. 63 of UW Extension Publication A3646 Pest Management in Wisconsin Field Crops . What can you expect from Bt Corn and Insecticidal Seed Treatments for black cutworm control? Dr. Michael Gray, Entomologist at the University of Illinois Department of Crop Science posted an informative article in last week’s Bulletin newsletter titled ‘Black Cutworms, Bt Corn, and Insecticidal Seed Treatments: Recent Research Developments’, Issue No. 4. The article summarizes a research publication in the April 2011 issue of the Journal of Economic Entomology (Vol. 2, No. 104, pp. 484-493, DOI: 10.1603/EC10360) that sheds some light on interactions of black cutworm larvae with Bt corn and one insecticidal seed treatment. The work was done by entomologists at University of Guelph, Ridgetown Campus in Ontario, Canada.